Founders Press is the publishing arm of Founders Ministries. The press shares the same concerns and purpose as Founders Ministries, the recovery of the gospel of the Lord Jesus Christ in the reformation of local churches. 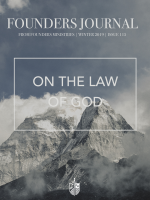 Founders Press is committed to producing and distributing books, pamphlets and other materials that are consistent with the doctrines of grace and the mission of Founder Ministries. These will cover devotional, theological, expositional, historical and pastoral areas of interest. The vision of Founders Press is to provide materials that can assist churches and believers in worship, personal devotion, private and group studies, discipleship efforts, and understanding our Baptist heritage. These will range from small, easy-to-read pamphlets to larger, more scholarly works. Our titles include books in print as well as in two digital formats: ePub (for iPad, Nook and other ePub readers) and mobi (for Kindle and other mobi readers). Founders Press takes as its theological framework the The Abstract of Principles. We desire to encourage the return to and advance of the biblical gospel that our Baptist forefathers held dear. If you are interested in submitting a manuscript or book proposal in keeping with this purpose, please refer to our Founders Style Guide and the Book Proposal and Author Information Form. A current copy of our style guide is available on our website to help you prepare your material. Please note: Proposals and manuscripts will not be considered for publication unless they are in keeping with our purpose statement, conform to the Founders Style Guide, and are submitted with a completed Book Proposal and Author Information Form. Manuscripts will not be considered ready for publication or included in our publication schedule until they are completed, edited to conform to the Founders Style Guide and approved. Manuscripts or book proposals submitted that are not in accordance with the Founders Style Guide will be returned. Please send a digital file as a Word document (.doc or .docx). We will not consider or accept manuscripts or book proposals that are not in digital format. Also send a PDF file (.pdf) of your manuscript or book proposal. If sending material through the mail, provide a hard copy printed on one side of the paper. You can send your digital files as email attachments (including the cover letter and completed-scanned Book Proposal and Author Information Form). We will not accept manuscripts or book proposals sent as email text or fax. If you are sending material in the mail and wish your material returned to you, please include a self-addressed and stamped return envelope. We will try to respond to all submissions as quickly as we are able. If you have not heard from us within 100 days of submitting your manuscript or 50 days of submitting your book proposal, please contact us to inquire about its status.